In 1982, The American Philatelic Society published The Admiral Issue of Canada by the Hon. George C. Marler. This 567 page book has become indispensable for the study of the Admirals, although the illustrations and index leave something to be desired. The major problem collectors run into when starting to specialize in the Admirals is understanding the terminology used in this book. Marler gives detailed descriptions of some of the terms he uses, but does not illustrate them. 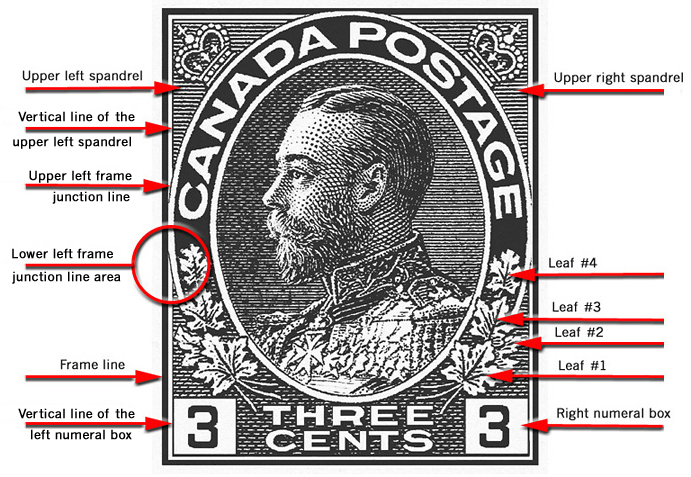 To remedy this problem, Richard M. Morris, on behalf of the Admiral Study Group of the British North America Philatelic Society published in 2001 a small booklet entitled A Guidebook to the Admiral Issue of Canada: Understanding Marler and Others (also known by the short title Understanding Marler). As helpful as this booklet is, it is not generally available in the philatelic literature market. I have incorporated quite a bit of the information from Understanding Marler into this series of web pages on the Admirals - for example, detailing the differences in the dies used on some Admiral denominations. On this page I illustrate and define many of the terms used by Marler. You will see in the image above a picture of the 3¢ Admiral stamp with many of the design elements labeled. I propose to comment on these elements and how they fit into the study of the Admirals. Spandrel is an architectural term for the space between an arch and a rectangular enclosure. On the Admiral stamp design, the upper left and upper right spandrels are the two roughly triangular spaces filled with horizontal lines and a crown. Although the lower left and lower right areas of the stamp technically are not spandrels, Marler also uses the term for these parts of the stamp design. As mentioned above, the spandrels are filled with horizontal lines. Marler says (p. 20) that he numbers these horizontal lines starting at the top line in each spandrel. But do not be surprised if you find him not following this rule from time to time. The horizontal lines in each spandrel may or may not be enclosed by a vertical line. Marler usually refers to this vertical line as "the vertical line in the upper right spandrel," or "the vertical line in the upper right." The vertical line may be unbroken or broken, fine or heavy, or perhaps retouched for some (or all) of its length. 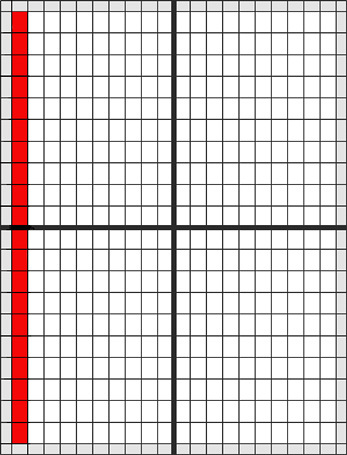 The illustration above shows the vertical line in the upper right broken between lines 3 and 4. The lower spandrels each contain four maple leaves. As shown in the top illustration, Marler numbers them starting with the bottom leaf. In addition to the leaves, the lower spandrels contain two numeral boxes: the left numeral box (LNB) in the lower left corner and the right numeral box (RNB) in the lower right corner. Each numeral box has a bottom line, which on the lower denominations often shows slight doubling due to re-entries (double transfers). Each numeral box also has a vertical line. These lines are significant in that they can be fine, medium, or thick. They can also be retouched or broken in various places. These characteristics are often used by Marler to determine types. As an example, the illustration above shows a break near the top of the vertical line of the right numeral box. This break would be significant enough for Marler to consider it a separate type (defined below). The term spur, as used by Marler, has two different meanings. The first meaning - Spur (1) in the above diagram - refers to a short line extending from the frame line at a corner of the stamp. These spurs can point right, left, up, or down, depending on the frame line and the corner of the stamp involved. They are likely caused by retouches to the frame lines of subjects transferred onto the printing plate. Therefore, while a spur is constant to a particular subject on the printing plate, not all subjects on that printing plate will have a spur, and none will have the exact same spur. These spurs should not be confused with hairlines emanating horizontally from the corners of stamps. Hairlines tend to be much finer lines and often a bit longer. The second meaning - Spur (2) in the above diagram - refers to a sliver of metal on the relief of the transfer roll that is in the process of breaking off. Sometimes a line in relief on the transfer roll breaks under the tremendous pressure exerted to impress the stamp design into the softer steel of the printing plate. If a small piece of metal from a broken relief is still attached at one end, but bent at the other end, a spur like the one shown in the above diagram results. When it eventually breaks off completely, there will be a complete break in the line. This type of spur is a fairly rare occurrence, but a good example can be found on the 3¢ brown Admiral, plate 31 (Type 7A), where such a spur is found on 23 stamps before it disappears, leaving a break in its place. Others examples have been seen on the 1¢ green stamp. Also, note that the top of the triangle is also the top of the spandrel. As mentioned above, the area of the lower left frame junction line shows a lot of variation on several denominations. Pictured above are five different states of this area that you may encounter. 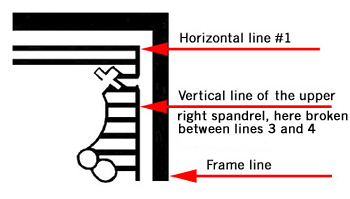 The lower left frame junction line is weak between line 1 and the top of the spandrel. The lower left frame junction line is broken between line 1 and the top of the spandrel. The lower left frame junction line is broken above the top of the spandrel. The vertical line of the lower left spandrel is broken between line 1 and the top of the spandrel. The lower left frame junction line and the vertical line of the lower left spandrel are broken between line 1 and the top of the spandrel. There are many other combinations of breaks, etc. that can happen in this area, but if you understand these five illustrations, whatever else you run across will seem logical, and more importantly, you will be able to describe it correctly. Each of the breaks shown in the above illustration is distinctive enough to be a new type in Marler's book. "The use of plates laid down with transfer rolls from either the Original Die or the Retouched Die, and 'relief breaks' that occurred in the engraving of the many plates that were made, account for the existence of a number of 'types' of the ONE CENT Green . . ."
"It will readily be understood that whenever a change is made in a die and one or more transfer rolls are taken from it, the plates laid down with these rolls will show the change. So that there will be a group of plates that corresponds to and reproduces each state of the die, and when the change in the die is noticeable the stamps of one group of plates may readily be distinguished from those from the other group of plates. "Within the plates of the same group, there may be differences resulting from a break in a line in relief or other damage to the transfer roll or some other peculiarities that are sufficiently distinctive to constitute a 'type' that can be identified positively with a particular plate or plates. Unfortunately, because of the large number of plates . . . it is not possible to describe a type for each and every plate." From these quotes, it can be gathered that a type is a set of characteristics visible on a stamp, usually (but not always) caused by changes to the die or by relief breaks on the transfer roll, that is common to a group of subjects on a significant part of one or more plates, that serve to identify the stamp as coming from a particular plate or group of plates. So how did Marler come up with all these types for each Admiral denomination? The Post Office Dept. kept a proof of every plate. Today these proofs are stored at Library and Archives Canada in Ottawa. Marler found out when the plates were manufactured. He recorded this date and the date each plate was approved (rubber-stamped on the proof) in his book. Note that chronological order and plate number order are not necessarily the same. Marler examined each proof and each stamp in the sequence it was transferred to the plate. This way, theoretically, he could record exactly where, for example, a relief break occurred, and how long stamps continued to be transferred to the printing plate(s) with this relief break. All the stamps with this particular relief break would constitute a type. In his book, Marler describes the characteristics of each type, numbers them in chronological order for each stamp, and lists the plates on which each type is found. Some Admiral collectors try to identify their stamps according to the Marler types, and annotate them in their albums according to Marler's type numbers. Types can be invaluable in identifying the plate or group of plates that a stamp with a re-entry or some other plate flaw comes from. Since the publication of Marler's book, students of the Admiral issue have discovered characteristics that Marler missed, characteristics that would warrant the definition of new types. However, more than 30 years later, Marler's types are a part of the accepted way of studying the Admirals, and new discoveries should probably be treated as extensions of Marler's framework rather than overhauling that framework and renumbering the types. Marler uses the word type without any qualifiers. Since there are also plate layout types and lathework types, students of the Admirals sometimes use the phrase design type instead of just the word type. However, it is usually clear from the context which type is being discussed. When Marler uses the word row, especially in connection with design type characteristics, he usually means column. Sometimes he uses the phrase vertical row to mean the same thing. In the above illustration of a sheet of 400 stamps, Marler would consider the red stamps to be the first row of stamps. Students of the Admirals usually use the word column in these situations because the word row generally has horizontal connotations. Copyright © 2007-2013 Randall W. Van Someren. Web design copyright © 2007-2013 The British North America Philatelic Society.